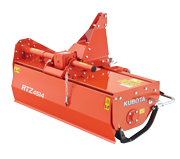 The Kubota RTZ range of high performance and multi purpose rotary tillers is ideally suited to meet most requirements within primary as well as secondary tillage purposes. The robust design, together with the unique rotor concept, put the Kubota RTZ rotary tillers in a class of its own in terms of versatility and durability. Furthermore with the best possible fuel consumption/tillage ratio in most conditions.